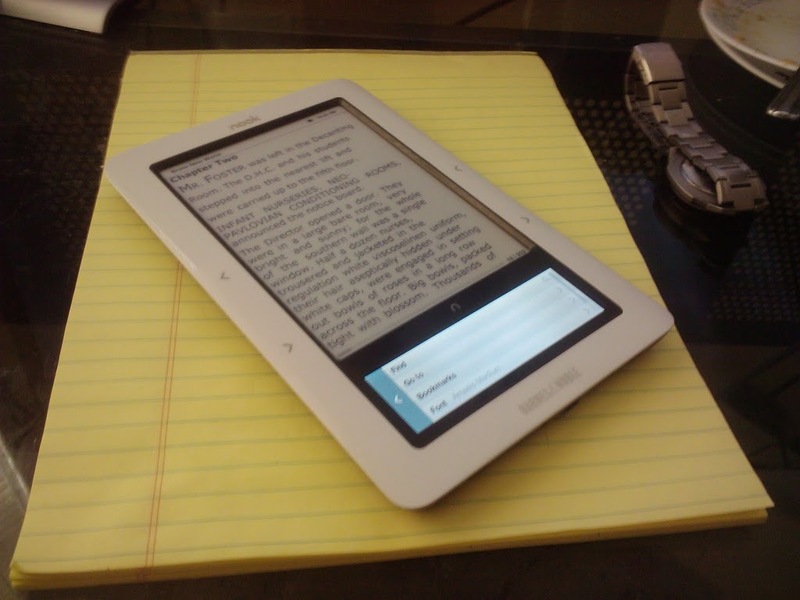 Well, it seems as though every writing blog out there has at least one entry on the subject of e-readers, so I might as well join in. A Nook has found its way into my home, and to be honest, I dig it. I really can’t understand why writers seem to be so afraid of new technology. The paper press industry isn’t going away for a long while anyway. Every other industry is modernizing, and the fact that we can blog about changes like e-books proves that we are adapting as well. This is simply the next step. For starters, my house is terribly cluttered. I do love my books, and how magnificent they look on the shelf, but if that collection keeps growing, I might find myself assembling fiberboard bookcases until I run out of wall space. Being at an age where I move constantly, being able to store an entire collection of books on a chip smaller than a penny also appeals to me. Perhaps the biggest reason I like it so far is purely an issue of my own. I like to read in bed, lying on my side, and I fumble with books in this position. Having the Nook has made for a really solid and simple way for me to read from here. The next reason why I think writers should embrace this format is the inherit trait of human laziness. I know it doesn’t affect everyone, but I have found myself doing more impulse buying with the Nook. Not having to go anywhere to walk away with a stack of books for significantly cheaper is quite alluring. Now, all of this doesn’t mean I am going to stop buying physical books or that I will stop being a patron of local bookstores. I simply find myself buying the books I would not have before. I have a major problem paying more than 15 dollars for any book, and thankfully this solves that problem. I know I will catch some flak for that last sentence, but hey, I’m not wealthy enough to buy a stack of premium hard backed books on a whim. I’m also a tech junkie, so let me continue to drool over my newest android based toy.